This Memorial Day, as we remember Americans who died while in military service, we call upon an eyewitness to one of the many tragedies (“a minor accident of war”) during World War II. A second lieutenant in the 8th Air Force, Edward Field served in Europe as a navigator for heavy bombers. During the period he was flying missions over Germany, he frequented the Officers’ Club in the evenings to relax and there met Coman Leavenworth, his “first poet ever,” and he soon began writing poetry himself. 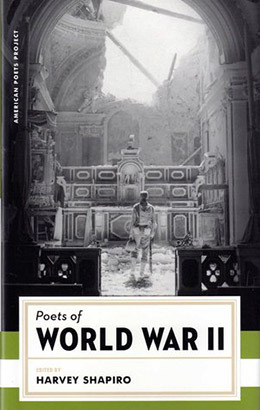 After the war, Field’s first published poem appeared in London’s Poetry Quarterly, but he never saw the issue containing it until a friend tracked down a copy for him almost six decades later. It was not until 1963 that his first collection of poetry, Stand Up, Friend, With Me, was published and was chosen as the year’s Lamont Poetry Selection. on signal from the lead bomber in the squadron. . . . If you don't see the full poem below, click here (PDF) or click here (Google Docs) to read it—free! What an astonishing, what a vivid poem. The documentary effect is startling, and yet is poetry--so precise and economical. I just had to find out what would happen. This is an unforgettable poem. It would have been easy to sentimentalize this material, but because of Field's matter-of-fact tone the poem achieves the purity of feeling one encounters in the great Greek tragedies. This is one of my favorite poems in the world. Among its many felicities: the sea described as "scary"; the omission of the second "in" from the line "water rushing in like a sinking-ship movie"; the "convenient" door in the roof to climb out by. All of these unwriterly details remind that not just the incident is real; the teller is, too. A poem to be grateful for.